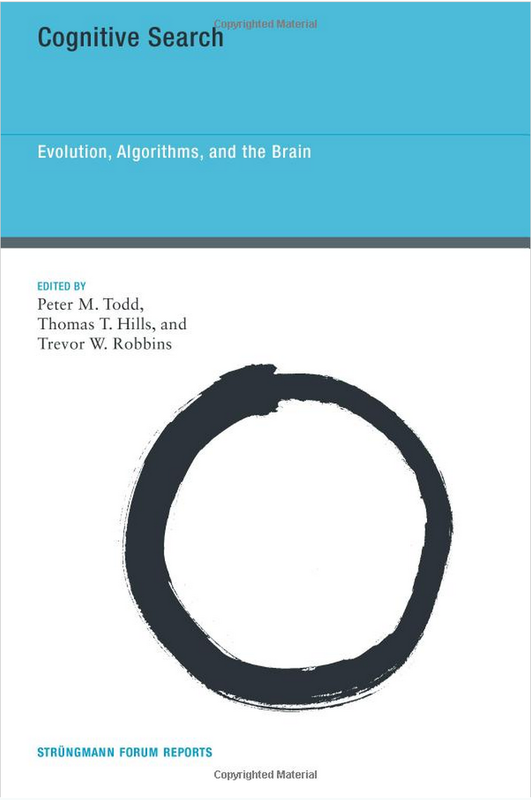 Cognitive Search: Evolution Algorithms and the Brain. MIT Press. I am interested in the evolution of cognition and information and their relation to language, wellbeing, memory, and decision making. My research involves using sizable data, network science, and machine learning. I am the Director of the Bridges-Leverhulme Doctoral Training Centre, I initiated and lead the Behavioural and Data Science MSc, and I co-direct Warwick's Global Research Priority in Behavioural Science. I am currently a Fellow of the Alan Turing Institute. The Turing Institute offer PhD studentships to work with its Fellows for exceptional candidates. I am also a Research Fellow of the Royal Society. Does my algorithm have a mental health problem, published in Aeon. Masters of reality: the evolution of Shamanism, published in Aeon. Herzog, S., & Hills, T. T. (2019) Mediation centrality in adversarial policy networks. Complexity. Article in press. Hills, T.T. (2018). The dark side of information proliferation. Perspectives on Psychological Science. Advanced online publication. Jagiello, R., & Hills, T.T. (2018). Bad news has wings: Dread risk mediates social amplification in risk communication. Risk Analysis, 38, 2193–2207. Hills, T. T., & Siew, C. S. (2018). Filling gaps in early word learning. Nature Human Behaviour, 2(9), 622. Engelthaler, T., & Hills, T. T. (2018). Humor norms for 4,997 English words. Behavior Research Methods, 50(3), 1116-1124. Dubossarsky, H., De Deyne, S., & Hills, T. T. (2017). Quantifying the structure of free association networks across the life span. Developmental Psychology, 53(8), 1560. Engelthaler, T. & Hills, T.T. (2017). Feature biases in early word learning: Network distinctiveness predicts age of acquisition. Cognitive Science, 41, 120-140. Sgroi, D., Hills, T. T., O'Donnell, G., Oswald, A. J., & Proto, E. (2017). Understanding Happiness: A CAGE Policy Report. Centre for Competitive Advantage in the Global Economy. Noguchi, T., & Hills, T.T. (2016). Description-experience gap in choice deferral. Decision, 3, 54-61. Hills, T.T., Proto, E., & Srgoi, D. (2015). Historical analysis of national subjective wellbeing using millions of digitized books. IZA Discussion Paper No. 9195. Hills, T.T., & Adelman, J. (2015). Recent evolution in the learnability of American English from 1800 to 2000. Cognition, 143, 87-92. Jones, M.N., Hills, T.T., & Todd, P.M. (2015). Hidden processes in structural representations: A reply to Abbot, Austerweil, and Griffiths (2015). Psychological Review, 122, 570-574. Bilson, S., Yoshida, H., Tran, C., Woods, E., & Hills, T.T. (2015). Semantic facilitation in bilingual first language acquisition. Cognition, 140, 122-134. Hills, T.T. & Butterfill, S. (2015). From foraging to autonoetic consciousness: The primal self as a consequence of embodied prospective foraging. Current Zoology, 61, 368-381.